Sale, UK (February 20th 2019) – TopMark Solutions is proud to announce its sponsorship of Warrington Wolves for the 2019 Rugby Super League season. The Sale-based facilities management company are keen Rugby League supporters, with every member of the family having been a season ticketholder in the past or present. 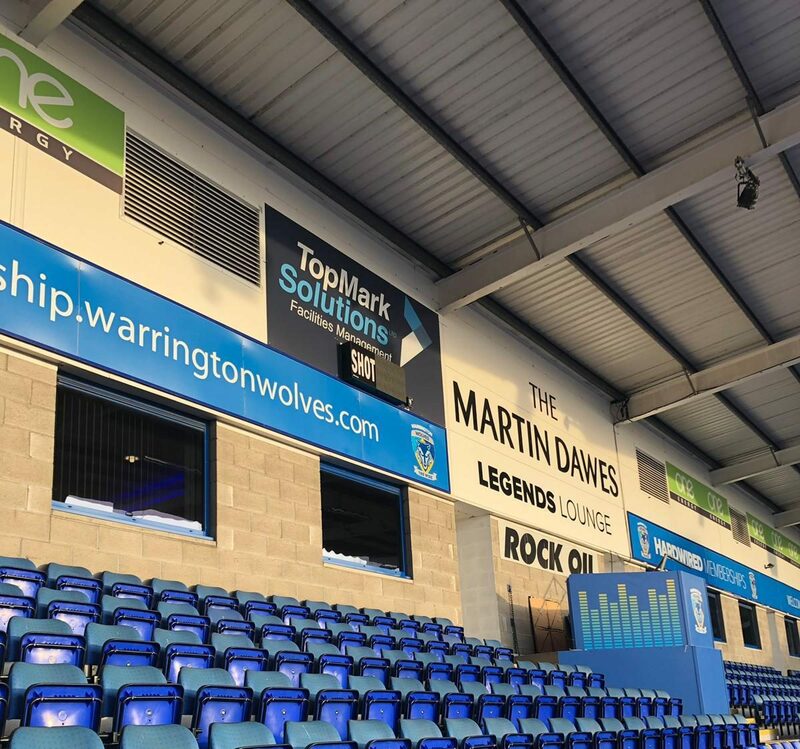 TopMark signage placed in Halliwell Jones Stadium. TopMark sponsor new ‘shot clock’ to count time ball is in touch. TopMark proud to sponsor Wolves legend and assistant coach Lee Briers. Warrington Wolves have started the new season strongly, recording two impressive wins in their first two fixtures, and TopMark Solutions are delighted to cement their long-term association with the club. 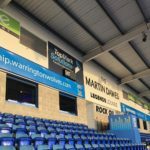 The new sponsorship deal sees TopMark Solutions signage placed in key locations in the Halliwell Jones Stadium, including outside the Martin Dawes Legends Lounge. TopMark Solutions are now the official sponsors of the ‘shot clock’, a new introduction for the 2019 Super League season which counts the time the ball spends out of play. As a result, less time is wasted and the players are given more active game time during which they can score points, something Warrington Wolves have embraced with wins of 26-6 over Leeds Rhinos and 28-14 over Hull KR to start their campaign. The TopMark Solutions facilities management team have also been hard at work during the off-season, redecorating head coach Steve Price’s box to get everything shipshape for the 2019 title race. “I was lucky enough to work for the club when I was 16 at the old Wilderspool Stadium and part of my duties was running on the kicking tee for Lee Briers. “Lee has since hung up his boots and is now assistant coach, which made our player/coaching sponsorship an easy selection. I had always kept in touch with Lee and going from running on his kicking tee to sponsoring him has been a remarkable journey. TopMark Solutions are a facilities management company based in Sale, providing services including jet washing, render cleaning and thermoplastic line markings. Business to Sponsor Amateur Sports Person Taking Part in the European Duathlon Championships.